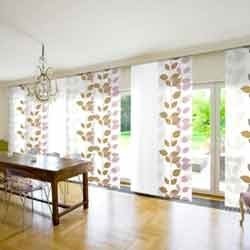 Panel Track Blinds popularly known as sliding window panels is a perfect solution for light, privacy control and even for dividing a room. Each panel is made up of fabric that glides smoothly on its own track. When opened, the overlapping panels stack on either left side or right side to provide space and allow light for clear view outside the room. Incorporated in the year 1962, at Ghaziabad (Uttar Pradesh, India), we, “ALPS Industries Limited,” are recognized manufacturer and supplier of High Tensile Structures Products, Interior & Exterior Furnishing Products, Architectural Products and Baby Care Products. Our offered products array comprises Window Blinds, Designer Awnings, Wooden Floorings, Wall Panels, Architectural Hardware, Designer Umbrellas, Baby Care Products, Automation System, etc. Range of our architectural and hardware products is widely used in houses, restaurants, hotels, shopping centers and other commercial buildings. These products are acclaimed by customers for the features like sturdy construction, reliable usage and elevated durability. All our decorative products are offered to clients under the brand name VISTA. Apart from this, our baby care products are designed keeping the delicate skin of children in mind. Moreover, provided products are available in different sizes and specifications as per the needs of our valued customers.